How Much More Corrupt Is The New York Times Than When You Were Born? 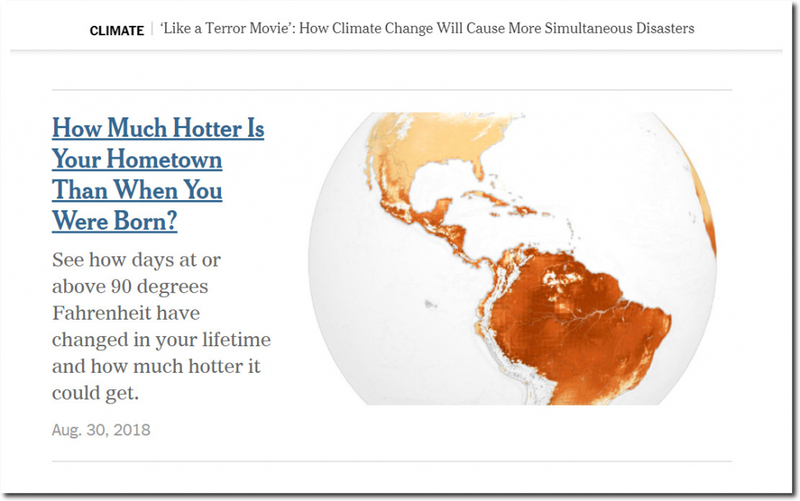 I was looking at the New York Times “Climate Change Is A Terror Movie” article, and in the middle of the page they link to “How Much Hotter Is Your Hometown Than When You Were Born? I went to that page, and they asked me to enter my birthplace and birth date. 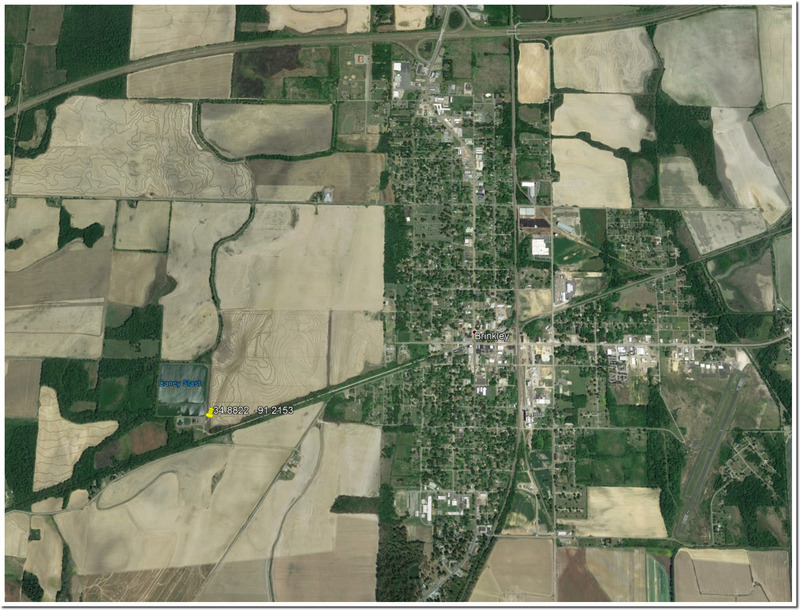 I entered Brinkley, Arkansas and 1920, because that was the earliest year they would allow me to enter. I’ve don’t think I have ever been to Arkansas, but known that Brinkley has a well sited USHCN station. 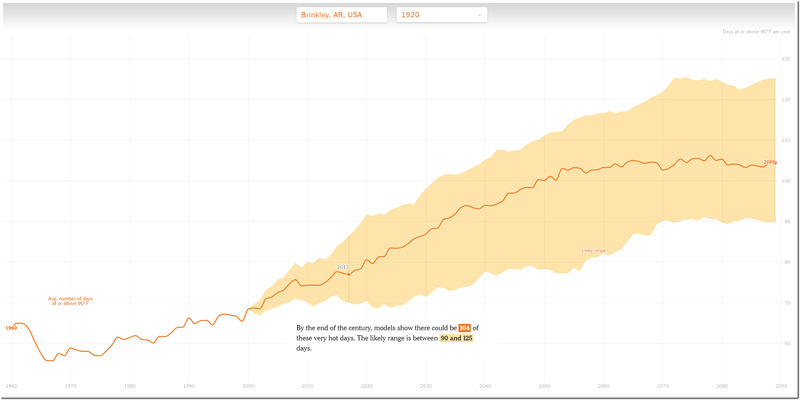 The graph below shows the annual count of 90 degree days since 1920 at the NOAA USHCN station at Brinkley, Arkansas. It has decreased from about ninety days per year in 1920, to about fifty days per year now. The first message which the New York Times pops up is that their data set only goes back to 1960, even though they allow you to enter dates back to 1920. 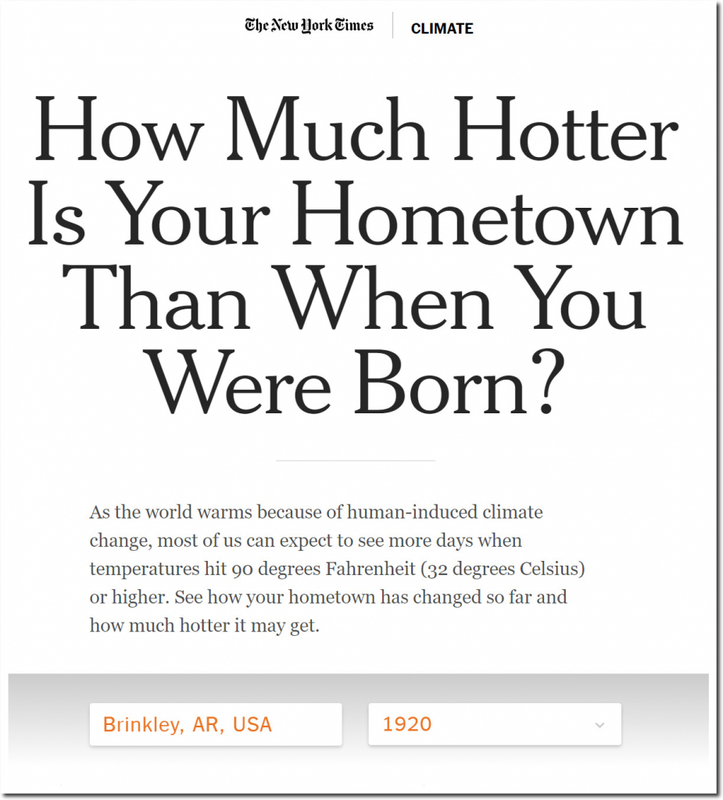 They correctly state that Brinkley averaged about 64 days per year over ninety degrees in 1960, but hide the readily available data showing that Brinkley was much hotter prior to 1960. So we already know they are hiding prior hot data, but here is where the real fraud kicks in. They claim that Brinkley now gets about 77 days per year above ninety degrees, when in fact the real number has decreased to closer to 50. They have reversed the trend from cooling to warming. Then they extend their fraud by claiming that number of ninety degree days will increase to above 90 per year in the future, and that it is caused by CO2. They are lying about everything. 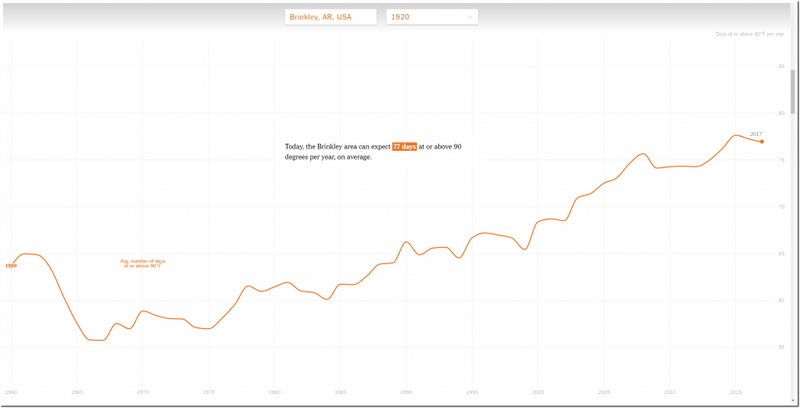 Brinkley used to average about 90 days per year above ninety degrees when CO2 was below 310 PPM, and in 1925 they had 131 days per year above ninety degrees. The trend is down, and not up, and it obviously is not due to CO2. 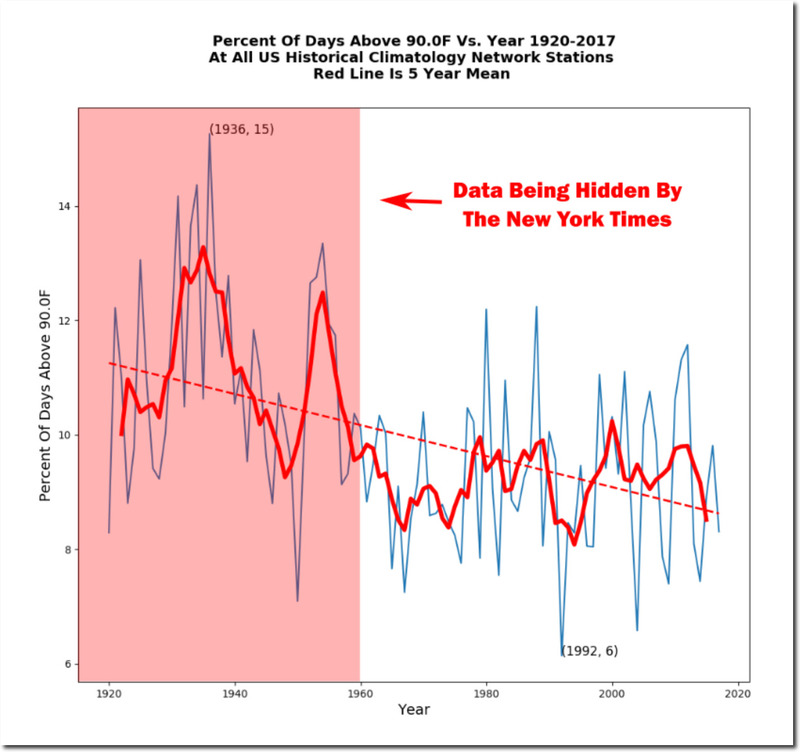 So why are they hiding pre-1960 data? Because the US used to have a lot more ninety degree days before 1960, and it wrecks their scam. The New York Times are propagandists, not journalists. I took my 96 year old step-grandmother out for lunch on Easter Sunday in New Jersey, and she told me that the New York Times is the only news source she really trusts. She does remember that New York was very hot when she was a child. I have been calling out the New York Times on their fraud for a decade. They write hit pieces about me, but refuse to talk to me. What they are doing has nothing to do with journalism. When I was a child I assumed this sort of fraud at a newspaper was a scandal. But now I understand that it is standard operating procedure. 18 Responses to How Much More Corrupt Is The New York Times Than When You Were Born? Thanks. I have a newspaper publisher friend who knows everyone at the New York Times. She has tried to get them to talk to me, but they have no interest in the truth. Send this to FOX NEWS and even CNN News. I’m sure Sean Hannity would happily debate Chris Cuomo on these facts. New York is becoming more delusional as time passes. Most of those people who live there (northeastern U.S. in general) seem trapped from being able to explore the reality and rely on so-called “printed facts” rather than exploring an actual countryside. Not sure that Joe has any interest in the truth, but he is wicked-smart. If they did publish an honest article about your contrasting fact, it would alienate their ever-shrinking-but-furiously-loyal-progressive readership. In the end, publishing a “news” paper is about making money. Ergo the editors must believe that their narrative is selling papers… or they are consciously engaging in propagandism. I tend to think that the reality is that they are doing BOTH. You think the NYT is bad… try the Canberra Times. Canberra is the most extreme leftist city in Australia. For example, it was the only territory leftist enough and stupid enough to vote “Yes” for the deeply flawed republic referendum in 1999. The point being that when all of your customers are so far to the left of centre, the paper has to pander to their far left of centre views. It is part of the Fairfax stable, but is still noticeably further left than the Sydney Morning Herald. It isn’t the paper’s fault; it’s just that nobody would buy it in Canberra otherwise. There’s no money in the truth. A recommendation: Put a birthdate of 2018/2017/2016 into the NYT database, along with a US HCN station, say, near NYC. Let’s see what their database says about how many 90+ degree days there were this summer and in the recent past, and how well that squares with not just the US HCN station but the reporters’ own memories. And they wonder why they get called ‘Fake News’. Aw come on folks, I claim first prize. Over here in Mrs Mays’ gulag we have the biased BBC and its sibling called the guardian. I defy anyone to beat them. Without their cherry picks, the alarmists have absolutely nothing. Of course they will claim that before 1960, the technology did not exist to properly measure temperatures, which is total and complete nonsense. I would trust temperatures from 1920 far more than today’s agenda driven temperatures, those that can easily be manipulated to be warm biased by station siting if not downright cheating. Yep. True climate refugees from stifling heat of the mid 1930’s. And the inspiration for John Steinbeck’s “The Grapes of Wrath”. NYT is owned by a Mexican businessman heavily involved in international crime. He bought a 17% interest in the NYT for $250,000,000; structured as stock warrants. Even the guy who owns Amazon only paid $200,000,000 for a 100% ownership of Washington Post! Since the NYT only EARNS around $5 million on revenue of around $1.5 billion, there is NO WAY they can pay the interest on Carlos Slim’s money, much the less the principle…. so he is in essence the controlling owner of the paper, IMO. Well that’s news to me…. I thought Tony Heller and Steven Goddard where two different people.